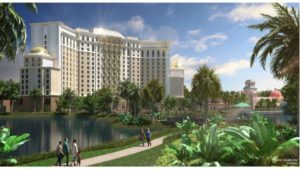 The new, 15-story Gran Destino Tower at Disney’s Coronado Springs Resort is set to open in July 2019, and Disney recently released more details about the tower. The tower will serve as the new main entrance for Coronado Springs, and will be home to more than 500 new rooms. A themed table service restaurant will be located at the top of the tower, giving guests a rooftop view of Disney World. Guests can start making reservations for the Gran Destino Tower beginning November 27. The tower is slated to open in July 2019. All of the resort’s 1,800 rooms have been updated.